The Government decided to transform the Employment Exchanges to Career Centres which shall connect local youth and other job-seekers with job opportunities through counselling and mapping jobs with skill requirements. National Career Service Portal will provide information about available career options, training courses, apprentice seats, job opportunities etc., and also resources for efficient functioning of Career Centres. The Career Centres would be the pivotal outreach and counselling interface of the National Career Service for teeming millions of aspiring youth from rural, semi urban areas as well as from disadvantaged sections of the society. These Centres would be staffed by motivated young professionals, enabled with necessary tools and infrastructure for effectively and continuously assessing demand of skills in labour markets, guiding youth visiting the Centres and by outreach to schools/colleges about, various training institutions, on-the-job training, job opportunities, etc., according to their aptitude and potential. These Centres would connect youth and other job seekers with jobs through portal, job fairs and other possible interface with employees such as campus placements. Last mile employability modules are also proposed to be offered. The Ministry circulated the guidelines to States for establishing the Career Centres and capacity building of the Employment Exchange officers had also commenced from 2014. 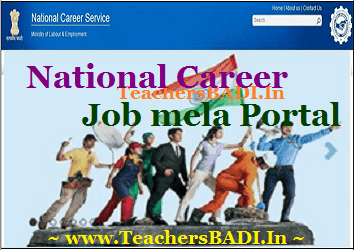 National Career and Employment Portal.